Zehut chairman calls on activists not to get too excited about poll granting his party 5 seats, but asserts Zehut can also reach 15 seats. Chairman of the Zehut party, former MK Moshe Feiglin, responded to the Israel Hayom poll which gives his party five seats. "Who would have believed that a party in Israel would publish a 340-page platform, sell it in bookstores, and within 10 days this book would take first place in the best-seller list?" Feiglin explained the increase in expected seats: "Our people is not stupid. It understands who respects it and its freedom, it understands who respects its intelligence and allows it to choose - to choose the truth. " "So please, just as you have not despaired of the polls, do not get carried away by them. Very hard work is ahead of us, more ups and downs are expected, and time is short. 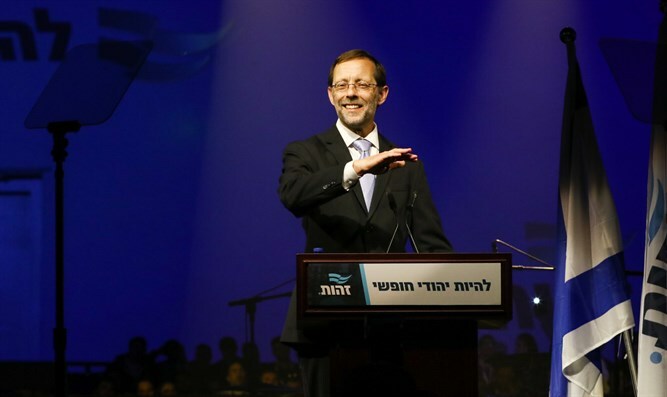 The people of Israel need a revolution of Zehut, and Zehut needs you wherever possible," Feiglin told his party activists. In contrast to the Israel Hayom poll, another poll published Thursday morning by Reshet Bet showed that Zehut does not pass the electoral threshold.